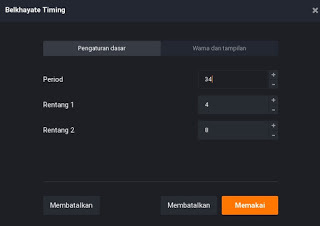 Recently the IQ Option trading platform has updated and added several new indicators, including Cloud Ichimoku, KDJ, DPO and Belkhayate Timing. On this occasion we will discuss trading strategies for forex, binary options and digital options. Whatever type of trading is in principle the same is predicting whether the movement will go up or down. 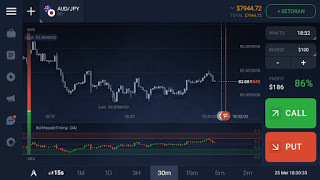 With the aim to help identify areas of interest that are profitable to buy or sell (moments to enter the market or open positions) and also the point of the possibility of a price reversal. 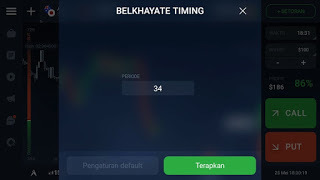 How to use the Belkhayate indicator? As we can see in the picture above, the Belkhayate indicator has 3 areas. We just discuss what each indicator area shows. When price movements are in the middle or middle area, traders are not recommended to enter the market or open trading positions. But if you open a position on this movement your chances of profit is 50% and your chances of being wrong are also 50%. This area (Upper and Lower) serves as a warning that issues signals for call / buy and put / sell with a higher degree of accuracy of possibility. Now that's the strategy tips and tricks on how to trade IQ Option using the Belkhayate Timing indicator. Hopefully this discussion can help you achieve profit consistently.